Do you know what ‘division by remainders’ means? Yeah, me either. 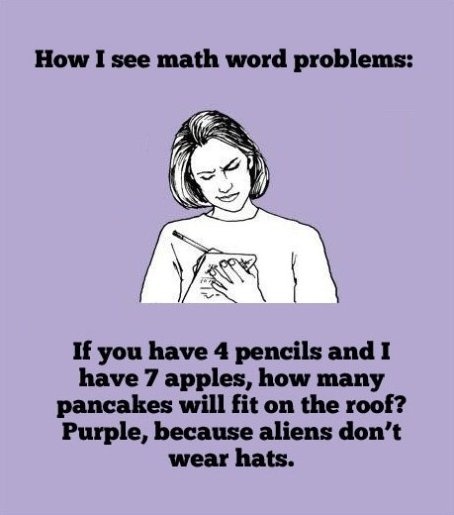 I learned this phrase after talking to my son Jake about his math homework. Apparently, this is a new term they’re using in the public schools to teach math. I had no idea what Jake was talking about until he described one of his math problems to me. This is how they learn to add, subtract and multiply. They have remainders or numbers left over, move this around to add or subtract this from that and then they get their answer. Me: Oh I get it now. That’s what we call long division. Me: That’s your math homework except we did it using a piece of paper to write out your work. We didn’t do this math thing in our head by taking numbers or adding them. Math is math, numbers are numbers. Jake: You just don’t get it mom, do you? Me: Not really. I don’t understand why you need to do all these extra steps. Jake: Alright, let me give you an example. If Jake has 32 crates, each crate has 10 shirts in them, 5 are blue and 5 are red. Jake gives 12 crates to Mary and 3 crates to John. Both Mary and John take 3 red shirts out of their crates. How many shirts are left? Jake: No mom, that’s not right. Me: Yes it is. It takes 10 minutes before your mother’s head explodes and she goes to get the calculator. Jake: What has 4 I’s and can’t see? Jake: Mississippi! I know how to spell that word, do you? Me: Yes, yes I do. Let me hear you do it first. Me: You missed a few letters. It’s M-I-S-S-I-S-S-I-P-P-I. Jake: How did you know that? Me: I know a song to help me remember how to spell it. When I was kid, we learned how to do things because of these silly songs. I guess they figured it was easier to learn a song to keep the information in our heads. Because of something called School House Rock, I can even say the Preamble to the Constitution. Jake: I know School House Rock. My dad has some of those DVDs. What’s a preamble? Me: It’s the beginning of the United States Constitution. (I sing the School House Rock song) You’ll learn this in school someday. At least I think they still teach this stuff. Jake: What’s the Mississippi song? I can totally relate to this! Now I am not a parent but I do have a younger sister in elementary school (there’s 11 years between us). So the style of teaching uses on her is similar to that of your son’s whereas I was taught long division. I find it so frustrating when I try to help her with her homework and she’s doing problems in ways I was never taught in school and they seem much more complicated. It’s like you have to go back to school to help your child with their homework! I know what you mean! I can’t understand what was wrong with the way we learned the math. I mean I still know how to do long division and can figure out a math question if someone asks. It just doesn’t make sense why they add more steps and make things more complicated. Pea, fart – any bodily function such as these is hilarious to a 9 yr. old. Also, I don’t always get the point of why they are teaching math to my older son as they are. I don’t find it so clear. I made the mistake of telling him and then he didn’t want to do it the way they told him. The teachers were not pleased. I don’t get the potty talk but I guess I’m just not a boy. I hear that it doesn’t stop and just gets worse the older they get. That’s funny about your son’s teachers. We had a parent/teacher meeting at the beginning of the year and the teacher told all of us parents that they would be teaching math a different way and for us NOT to tell them to do their homework another way. Then she told us that if we wanted to meet with her to learn the steps, she would set up a time to meet us. First in my teacher hat – we are told to strive to reach each child where he or she is. We have to appeal to their different learning styles. So, why I insist a kid do the problem a particular way? I don’t get it. DO they really expect you to come in and learn the steps? WHo has time for that? Btw, there are plenty of kids that I see that struggle with things you might have thought basic or natural. Despite that, some of the changes seem to be happening just for the sake of the change. I probably am still someone who will laugh at potty talk. Fine, I said it. Not all the time though. Don’t judge me. I was wondering what you as a teacher thought about all these changes in the way they teach. And yes, the teachers actually thought us parents would meet with them to learn how they do the math. Like we have time for that?!?! I honestly don’t know what wrong with the way we learned math. It’s worked for years so why fix what’s not broken? Tow thoughts – times and kids change. Not all of them are learning – not enough actually. The state of public education from my perspecitve is a bit scary. When you put that way – THAT makes sense. I wish the teacher would have said something like that rather than, we’re just gonna teach them something different so you won’t be able to help with homework unless you learn this. Im a pro – thank you very much. LOL I am funniest when I have a fever LOL!